Using Our Spare Time to Make Your Spare Time more fun! Read about our latest project - a frequency monitor and logger for the AC power line - it the October 2006 issue of Nuts and Volts magazine. 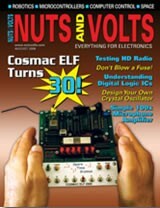 See Spare Time Gizmos on the cover of Nuts and Volts (again)! It makes me feel old just to think about it, but in August 2006 it has been 30 years since Joseph Weisbecker's famous COSMAC Elf article originally appeared in the pages of Popular Electronics Magazine. In honor of that anniversary, Nuts and Volts magazine is running a two part article about the Spare Time Gizmos COSMAC Elf 2000. The Spare Time Gizmos MP3 Player in Nuts and Volts! The October and November 2005 issues of Nuts and Volts magazine contain a two part construction project featuring the Spare Time Gizmos MP3 Player! Read about the STG1861 in Circuit Cellar Ink Magazine! Read issue #185 (September 2005) of Circuit Cellar Ink magazine and you'll find a detailed discussion of the theory behind the STG1861 "Pixie" emulator for the Elf 2000. New Product Introductions from VCF 7.0! We hope that you had a chance to visit our booth at this year's Vintage Computer Festival 7.0 and try out our latest products - the COSMAC ELF 2000 and our new "work of art" the Life Game. Spare Time Gizmos on the cover of Nuts 'n Volts Magazine! Well, it's not quite the cover of the Rolling Stone, but I have a feeling I'll have to buy five copies for my mother just the same. 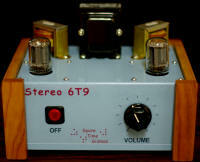 Spare Time Gizmos' retro vacuum tube amplifier project, the Stereo 6T9, is featured on the cover of the August 2004 issue of Nuts 'n Volts magazine. Please, buy a copy today and let our friend Editor Dan know how much you like the article! Spare Time Gizmos Releases Free TextRecorder Demo! How do two people and two golden retrievers share their eclectic interests with the world? By starting a hobby business, of course! Spare Time Gizmos offers home-brew circuits and software projects for you to play with.